Orange Pieces Value Pack 3pce wooden peg puzzles for toddlers is a combination of a colorful plywood, a baseboard, 26 alphabet puzzle pieces and 10 numeric puzzle pieces from 1 to 10 with fun pictures under each piece. 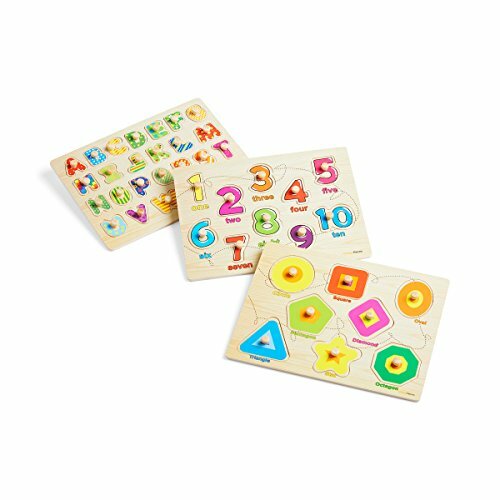 This delightful, and interactive set features solid boards with the alphabet, numbers 1–10, and shapes for plenty of early educational letters and number fun. Toddler peg puzzles specially designed to help your child cognitive development learning basic number and alphabet. The numeric 10-piece puzzle has large pegs perfect for little fingers to pick up and hold of numbers one to ten for better counting skills and number recognition. Each numbered peg has a bright illustration under that shows the number as represented on the piece. These vibrant puzzles are ideal for helping to develop letter recognition and pre-reading skills. Under each colorful peg is a fun illustration that starts with the same letter, like a basket under the letter "B." Slightly advanced than the other two included puzzles, the Alphabet puzzle is designed to help get your toddler on their way to comprehending letters as well as promoting hand-eye coordination and exceptional fine motor skills. A, B, C, 1, 2, 3 and what color do you see? Help your child prepare for school with brightly colored peg puzzles that introduce letters, numbers, shapes and colors. Easy-grasp pegs and pictures under pieces make these three great matching activities ideal fun for learning and excellent motor skills. Click the yellow "Add To Cart" button and let your kid be the next big thing in the Genius world! EASY EARLY LEARNING PUZZLE TOYS: Your daughter or son will really love playing with these well made sturdy wooden peg puzzles. Recommended for essential first learning in both Mathematics and English with the ABC, 123 and shape beautiful wood puzzle pieces of different colors. The colors also form a learning for them. Kids can play this cute game amongst each other, or by themselves. KIDS DELIGHT: While learning educational basics, your kids are also delighted by the 3 piece peg puzzle games. Watch as they play and learn with their friends. They match the pieces in their respective places on the board. 1 on ONE, 2 on TWO, 3 on THREE and so on. Elementary pupils can now identify the alphabets and numbers better. Interesting yet educative. SAFE FOR KIDS: Safe and compliance tested to use peg puzzle for toddlers. The curves on the edges of the learning puzzle pieces give you piece of mind. The boards can be placed on the floor, or a table and they sit safely there as the kids play this puzzle set. Learn and Laugh. It's a wonderfully safe game that's also challenging and great for repetitive finger learning. GENIUS IN THE MAKING: This peg puzzle kids game not only makes your kids ready for an academically brilliant future, but it also helps them to be intelligent and smart. This vibrant game helps your kids concentration, develop hand-eye coordination, fine motor skills, and best visual perception. FAMILY GAME: These peg puzzle family games are for everyone in the family, young or old. For the young ones, they have a game that helps them practice and enjoy for Mathematics and English. For adults, this game takes us back to our childhood. The kids will be happy seeing everyone join them as they learn and play. All ages can help the kids learn AND spend quality time together! If you have any questions about this product by Orange Pieces, contact us by completing and submitting the form below. If you are looking for a specif part number, please include it with your message.